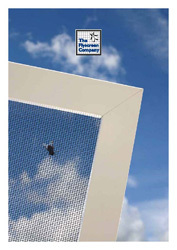 Ideal for preventing the passage of flies, wasps, mosquitoes, moths and other unwanted insects. Stainless steel mesh is stocked as soffit mesh in various widths, or in 30m rolls with a width of 1.22m wide that is available by the metre. 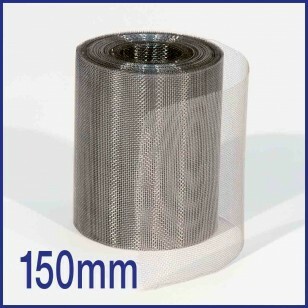 Additionally, we stock aluminium mesh, also available online by the metre. Our stainless steel insect mesh (fly mesh) is durable and corrosion-resistant, manufactured from stainless steel and of the highest quality (woven conforming to ISO 9044:1999). Far stronger and longer-lasting than mesh made of other cheap materials and available elsewhere, it can be cut to size and shape with a good pair of household scissors. 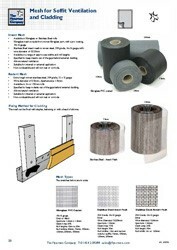 Cladding / Soffit Mesh can be stapled in place - Ask us about our heavy duty staple guns and staples available. It can also be secured with a bead of silicone. Flies, Wasps, Mosquitos, Moths and other unwanted insects.